« Question of the Week: Who Am I Cheering for in the Italian Elections? Sigh. I feel like a modern-day Sisyphus. Except I’m not pushing a rock up a hill, only to then watch it roll back down. I have a far more frustrating job. I have to read the same nonsense day after day about “deep spending cuts” even though I keep explaining to journalists that a sequester merely means that spending climbs by $2.4 trillion over the next 10 years rather than $2.5 trillion. The latest example comes from the New York Times, which just reported about “deep automatic spending cuts that will strike hard” without bothering to provide a single concrete number about spending levels in any fiscal year. Yes, you read correctly. A story about budget cuts did not have any numbers for spending in FY2013, FY2014, or any other fiscal year. So, for the umpteenth time, here are the actual numbers from the Congressional Budget Office showing what will happen to spending over the next 10 years if we have a sequester. And the NYT story actually has some decent reporting on how Republicans so far have (fingers crossed) avoided the tax-increase trap that Obama thought the sequester would create. But one would still like to think that Journalism 101 teaches reporters to include a few hard facts when writing stories. Particularly if they’re going to use dramatic adjectives to describe what supposedly will happen. Anyhow, this is just part of a larger problem. As I explained in these John Stossel and Judge Napolitano interviews, the politicians and interest groups have given us a budget process that assumes ever-increasing spending levels, which then allows them to make hysterical claims about “savage” and “draconian” cuts whenever spending doesn’t rise as fast as some hypothetical baseline. This is why almost nobody understands that it’s actually relatively simple to balance the budget with a modest bit of spending restraint. My goal is reducing the burden of government spending, not fiscal balance, but it’s worth noting that we’d have a balanced budget in just 10 years if spending grew by “only” 3.4 percent annually. jlue – nail, meet hammer! Seriously, I couldn’t have said it any better. Maybe because you spend your time lecturing propaganda machines instead of journalists? You are correct. One needs a thorough understanding of a subject in order to teach. One just needs to read or hand out ditto’s in order to Profess. I remember saying the US was dumbing down in the early 1990’s. Is this the result? Eric, the most educated are barely literate. That is the problem with liberal government schools of today. Many high school teachers and most college professors are so busy indoctrinating they do not have time to teach. They should all be tarred and feathered, put in stocks with government-issued cream pies supplied for throwing in their faces. Reblogged this on THE BS BLOG. I never thought I’d see the day when the American populace including it’s most educated would watch and condone while the country’s finances are decimated by $1trillion plus each year. Folks, 4 years ago a “trillion” was a foreign word except for the derivatives market. What the heck has happened to everyone? A dollar today is not worth a dollar tomorrow. Accounting for inflation is not a bad thing to do. Republicans should offer to hold spending constant in unadjusted dollars, if Democrats are so concerned about this “cut”. Barry: I’m not a government employee so I would assume that the money that flows out of Washington to fund jobs like mine is less important to HUD than the money that stays in Washington to fund their own jobs. Obviously the laws of mathematics and finance don’t matter when you have an economy as large as the United State’s. America has achieved what no one thought was possible…. the point where money does grow on trees. If mathematics and financial laws DO matter then America’s enemy has already invaded her top offices. Trust but Verify: Show us the big cuts! mike: The catch is that everyone in the Obama Administration and the media will do everything they can do to make sure people notice. They will quietly inform every affected federal worker that the way to handle this is slow-walk everything – make the public feel the pain so they’ll think twice about cutting again. Why is HUD “saying” that? Could it possibly be that they want to reduce services in as visible and painful a manner as possible, for political purposes? We know that the sequester involves only smaller increases, not actual cuts, so their budget for next year will actually RISE over the current year. Why, with an increased budget, should they be “forced” to make this kind of reduction? If the current management can’t run the program effectively with an increased budget over last year, let’s can them and get people in there who can do the job. This is a perfect example of a deliberate attempt to hurt the public with unnecessary cuts in service in order to score political points. It’s reprehensible, and the people involved ought to be fired. seems to me their shoddy/advocacy reporting actually helps – once the solar system-ending $85b slash and burn has occurred and inevitably no one notices a thing, what low information voter is going to be alarmed the next time cutting budgets comes up? Because roughly 47% of the voters aren’t capable of comprehending even this simple a graph? West: Kurt & Bob seemed to figure it out. Kurt: absolutely agree. But, HUD isn’t really cutting the rental assistance portion much, but is slicing the admin portion to run the program. It’s the admin portion that funds the personnel who put the research into fraud discovery, rent calculations, and income determination. And, a lot of work has been put into improving that in recent years with the EIV sysytem, and online systems that attempt to weed out recipients who are double dipping (collecting benefits in PA and FL for example) or even dead people who’s families are collecting benefits. To your concerns, I think Sec. 8 should have a time limit on it, like welfare (TANF) does. I also think it would be interesting to see how supply and demand would equalize without section 8. How many landlords would have to take significantly less rent to fill their apartments? Silly boy, didn’t you know every dime a politician wanted to spend, but can’t, is chalked-up as a budget cut? The average person cannot even tell what the hell you are talking about, much less what impact reductions in the rate of spending increases (which is what we are really talking about, here, not cuts) will have. if you cannot even summarize what you are talking about clearly in a full paragraph, I tend to think it is something we could easily do without. Very good visual, but it should have been extended back to 2007 or even 2000 to show the extraordinary continuing greed of big government. Bob, I’m not saying the program shouldn’t change. There are gross inefficiencies and out right redundancies in the way the Feds do business. Local PHA level innovation is handicapped by Federal requirements. I wasn’t arguing for the status quo, I was pointing out a “deep cut” in response to the blog post. There are much more efficient means of cutting the budget than the blanket across the board cuts. Just consolidating redundant programs with their separate budget analysts and their separate department managers etc. etc. would save a massive amount of money without really changing anything. 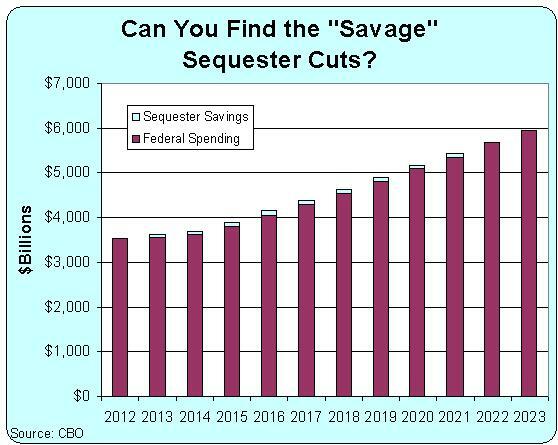 Again, not arguing that nothing should be changed, just that sequester is going to be a dumb way to go about it. Frankly, I’m for pushing most Federally paid for charity programs down to the state level, and letting state governments decide what to do and fund it: expand, reduce, status quo, whatever. State governments are more responsive to local needs and desires. If Mississippi wants to end housing assistance and California wants to expand it, let them. It’ll come out of their tax payers’ pockets. With regards to HUD and section 8 housing; what you describe is not a bad thing necessarily. Like all Washington spending, a small shock, or even a large one if you prefer might awaken and rekindle and effort to redesign the program to fit the needs of its original mandate. As a landlord who accepts housing vouchers, I see too many people who can afford to pay the rent but have found the loophole in Section 8 and because they don’t want to pay the rent, or sometimes just want a bigger and better apartment, the government blindly subsidizes. This was not the program’s original intent. Section 8 was a transitional program, a brilliant segue from the projects and into solid housing in good neighborhoods. It has been co-opted by people who don’t want to work. Frankly, I don’t know what you do with people who don’t want to work but for the working poor, Section 8 has been a benefit and blessing. The way things stand now, it would be better to have the whole program fail and pick up the pieces. Another big Washington blunder and mess. Why can’t some Rep and Conservative( I know) groups pool some money and buy some billboards across the country with just this graph. It basically makes the argument in one picture. Why make the argument so hard? And every employee for or user of every program will say the same thing regarding their particular program. So what. It will be difficult to run the program. Make cuts, make changes like the rest of us do to our budget every day based on the income we make. Various Famous Economists, such as Professor Laurence Kotlikoff of Boston University, claim that the so-called “national debt” is about $228 Trillion, & going up about $1 Trillion a month. Does anybody actually believe that they can Balance the Budget- in ten years- or at all???? Whether you like the Section 8 (HCV) program or not (I’m not a huge fan, but it pays the bills), HUD has an administrative fee grant to PHA’s that run HCV programs. This is the money that is used to administer the program, PHA’s may not use rental assistance money (HAP) to pay administrative costs. HUD has done studies to determine what rate per voucher unit month should be paid out to PHA’s based on their geographic location. In a normal year, HUD pays about 90-ish% of that rate to PHA’s. With sequester, HUD is saying they will be paying out 69% of that rate. It will be difficult to run the program effectively on those rates.